We now begin to look at the prophetic core of what was revealed to the seven churches. Futurists are divided as to how events described in the Revelation will be fulfilled. For example, we find three basic views expressed by Futurists regarding the millennium. While all three views include belief in a yet future to us return of Christ, there is divergence as to when this will occur relative to the millennium. Some believe that Christ will initially return to “rapture” Christians off the earth. Following such “rapture” will be a time of great tribulation involving catastrophic world events as depicted in the Revelation. Christ will then return to establish His Kingdom and begin a literal thousand-year millennial reign. Those who believe in this approach are called Premillennialists or Dispensational Premillennialists. Other Futurists believe that the millennium is to follow the evangelizing of the world, leading to a period of peace on earth for a thousand years or more. Christ will then return after this period of time. This position is known as the Postmillennial view. A third view is called Amillennialism. This view postulates that the present church age is the millennium and Christ will return at some future point to facilitate resurrection and a final judgment. Since these three views involve different interpretations of the Revelation, we will look only at the view of the Dispensational Premillennialist as this view is the most representative of current day Futurism. Preterists also have divergent views as to how the Revelation is fulfilled. There are Partial Preterists who mix in some Futurism in believing that much of the Revelation was fulfilled in the events associated with the Roman/Jewish war but believe Christ will return in the future to facilitate resurrection and final judgement. Full Preterists believe the entire Revelation was fulfilled when Christ returned in judgement upon Israel resulting in the destruction of the temple, the city of Jerusalem and the Jewish religious system extant at the time. It is believed this event brought the Old Covenant system of death to an end and fully established the New Covenant system of life which corresponds to establishment of a spiritual Kingdom represented by the New Jerusalem. Resurrection is viewed as passing from spiritual death unto spiritual life. Since Full Preterism presents the best contrast with Dispensational Premillennialist Futurism, we will only consider the full Preterist view in these essays. IMPORTANT: Since the primary purpose of these essays is to contrast the Futurist and Preterist view as to when the Revelation is fulfilled, we will examine the details of this prophecy only as they have direct bearing on the timing of the fulfillment of events prophesied. 1-11: After this I looked, and there before me was a door standing open in heaven. And the voice I had first heard speaking to me like a trumpet said, "Come up here, and I will show you what must take place after this." At once I was in the Spirit, and there before me was a throne in heaven with someone sitting on it. And the one who sat there had the appearance of jasper and carnelian. A rainbow, resembling an emerald, encircled the throne. Surrounding the throne were twenty-four other thrones, and seated on them were twenty-four elders. They were dressed in white and had crowns of gold on their heads. From the throne came flashes of lightning, rumblings and peals of thunder. Before the throne, seven lamps were blazing. These are the seven spirits of God. Also before the throne there was what looked like a sea of glass, clear as crystal. In the center, around the throne, were four living creatures, and they were covered with eyes, in front and in back. The first living creature was like a lion, the second was like an ox, the third had a face like a man, the fourth was like a flying eagle. Each of the four living creatures had six wings and was covered with eyes all around, even under his wings. Day and night they never stop saying: "Holy, holy, holy is the Lord God Almighty, who was, and is, and is to come." Whenever the living creatures give glory, honor and thanks to him who sits on the throne and who lives for ever and ever, the twenty-four elders fall down before him who sits on the throne, and worship him who lives for ever and ever. They lay their crowns before the throne and say: "You are worthy, our Lord and God, to receive glory and honor and power, for you created all things, and by your will they were created and have their being. Preterists see John saying that after delivery of the messages to the churches, he is invited to be spiritually present in the throne room of God where he is given vision of what would soon take place. The expression “after this” (Greek meta tauta) is the same as “take place later” as seen in 1:19 and literally means “after these things.” The expression in 1:19 is preceded by the Greek mello which signifies something about to take place. The Preterist believes what John was about to see were things that were about to take place on the heels of the messages sent to the seven churches. Futurists view the phrase “after these things” as things that will happen after the “church age.” Since Futurists view the message to the seven churches as pertaining to seven different eras of the church or as conditions extant in the church throughout its history. It is believed that what John is now about to see pertains to what will occur after true Christians are raptured and the “Laodician Christians” are left behind to face the tribulation along with the rest of the world. 1-14: Then I saw in the right hand of him who sat on the throne a scroll with writing on both sides and sealed with seven seals. And I saw a mighty angel proclaiming in a loud voice, "Who is worthy to break the seals and open the scroll?" But no one in heaven or on earth or under the earth could open the scroll or even look inside it. I wept and wept because no one was found who was worthy to open the scroll or look inside. Then one of the elders said to me, "Do not weep! See, the Lion of the tribe of Judah, the Root of David, has triumphed. He is able to open the scroll and its seven seals." Then I saw a Lamb, looking as if it had been slain, standing in the center of the throne, encircled by the four living creatures and the elders. He had seven horns and seven eyes, which are the seven spirits of God sent out into all the earth. He came and took the scroll from the right hand of him who sat on the throne. And when he had taken it, the four living creatures and the twenty-four elders fell down before the Lamb. Each one had a harp and they were holding golden bowls full of incense, which are the prayers of the saints. And they sang a new song: "You are worthy to take the scroll and to open its seals, because you were slain, and with your blood you purchased men for God from every tribe and language and people and nation. You have made them to be a kingdom and priests to serve our God, and they will reign on the earth." Then I looked and heard the voice of many angels, numbering thousands upon thousands, and ten thousand times ten thousand. They encircled the throne and the living creatures and the elders. In a loud voice they sang: "Worthy is the Lamb, who was slain, to receive power and wealth and wisdom and strength and honor and glory and praise!" Then I heard every creature in heaven and on earth and under the earth and on the sea, and all that is in them, singing: "To him who sits on the throne and to the Lamb be praise and honor and glory and power, for ever and ever!" The four living creatures said, "Amen," and the elders fell down and worshiped. Futurists see Christ being given the scroll to open the seals as an event yet future to us which will usher in the end time tribulation and the second coming. Being made a Kingdom of priests to reign on the earth is viewed as looking forward to the time of the millennium when Christ will rule with the saints from the physical city of Jerusalem. Preterists see the opening of the scrolls seven seals as occurring shortly after John is given the Revelation as this harmonizes with the imminency statements repeated several times in chapters one, two and three. Becoming a Kingdom of priests and reigning with Christ on the earth is viewed as participation in the spiritual Kingdom which becomes fully established when the temple is destroyed and the means to facilitate the Old Covenant system is removed. Thus the Old Covenant period is consummated and the new Covenant is established. Establishment of the New Covenant is equated with establishment of the Kingdom which is equated with establishment of the New Jerusalem. The New Jerusalem is seen as a spiritual representation of the New Covenant Church. 1-17: I watched as the Lamb opened the first of the seven seals. Then I heard one of the four living creatures say in a voice like thunder, "Come!" I looked, and there before me was a white horse! Its rider held a bow, and he was given a crown, and he rode out as a conqueror bent on conquest. When the Lamb opened the second seal, I heard the second living creature say, "Come!" Then another horse came out, a fiery red one. Its rider was given power to take peace from the earth and to make men slay each other. To him was given a large sword. When the Lamb opened the third seal, I heard the third living creature say, "Come!" I looked, and there before me was a black horse! Its rider was holding a pair of scales in his hand. Then I heard what sounded like a voice among the four living creatures, saying, "A quart of wheat for a day's wages, and three quarts of barley for a day's wages, and do not damage the oil and the wine!" When the Lamb opened the fourth seal, I heard the voice of the fourth living creature say, "Come!" I looked, and there before me was a pale horse! Its rider was named Death, and Hades was following close behind him. They were given power over a fourth of the earth to kill by sword, famine and plague, and by the wild beasts of the earth. When he opened the fifth seal, I saw under the altar the souls of those who had been slain because of the word of God and the testimony they had maintained. They called out in a loud voice, "How long, Sovereign Lord, holy and true, until you judge the inhabitants of the earth and avenge our blood?" Then each of them was given a white robe, and they were told to wait a little longer, until the number of their fellow servants and brothers who were to be killed as they had been was completed. I watched as he opened the sixth seal. There was a great earthquake. The sun turned black like sackcloth made of goat hair, the whole moon turned blood red, and the stars in the sky fell to earth, as late figs drop from a fig tree when shaken by a strong wind. The sky receded like a scroll, rolling up, and every mountain and island was removed from its place. Then the kings of the earth, the princes, the generals, the rich, the mighty, and every slave and every free man hid in caves and among the rocks of the mountains. They called to the mountains and the rocks, "Fall on us and hide us from the face of him who sits on the throne and from the wrath of the Lamb! For the great day of their wrath has come, and who can stand?" The Futurists sees the unveiling of the six seals as picturing the tribulation that will occur just prior to a yet future return of Christ. Parallels are seen with what Christ said in the Olivet Discourse as recorded in Matthew 24, Mark 13 and Luke 21. The white horse and its rider holding a bow, having a crown, and riding out as a conqueror bent on conquest is seen to represent what Christ said about false christs arriving on the scene and deceiving many. Some feel the “anti-christ” is represented here. The fiery red horse and its rider who is given power to take peace from the earth and to make men slay each other, is associated with Christ saying, “You will hear of wars and rumors of wars and nation will rise against nation, and kingdom against kingdom.” The black horse and its rider who is holding a pair of scales in his hand is compared to Christ’s observation that there would be famines. The pale horse is associated with pestilence that Christ said would occur. By tying the sayings of Christ in the Olivet Discourse to the opening of the six seals, the Futurist sees Christ speaking of the same events in both the Discourse with His disciples and in his Revelation to John in the message given to the seven churches. All this is viewed as being still future in fulfillment. Preterists agree with Futurists as to the parallels between the opening of the six seals and what Christ said in the Olivet Discourse. Preterists, however, sees the Olivet Discourse as undeniable evidence for the six seals of Revelation 6 pertaining to the first century Roman/Jewish war and not to some yet future fulfillment as Futurists conclude. Preterists point out that the Olivet Discourse is Christ’s response to the disciples question as to when the temple would be destroyed. The temple was destroyed in A.D. 70. Futurists respond that there is duality here and the temple will be rebuilt. Preterists ask the Futurists to provide scriptural evidence for such duality and the rebuilding of the temple. The Futurist responds by saying the events Christ spoke of in the Olivet Discourse and the Revelation have not yet occurred. Therefore they must still be future to us. Preterists point to a great deal of historical data from first century historians such as Josephus, Tacitus, Suetonius, Pliny the elder and others who all attest to a number of false messiahs, wars, famines, earthquakes, and martyrdoms occurring before and during the Roman/Jewish war. Preterists point out that when Christ finished explaining all that would take place leading up to and including His return, He said, “I tell you the truth, this generation will certainly not pass away until all these things have happened” (Matthew 24:34). Preterists believe it is the generation Christ was addressing at the time that would not pass away until these things happen. Futurists counter by saying Christ was referring to the generation existing at the time these things would take place which Futurists believe is our current generation or one still to arrive in the future. Preterists point out the word generation by context is seen throughout the NT to always refer to the generation being addressed at the time and there is no grammatical reason to conclude the word suddenly changes its meaning in the Olivet Discourse to mean a generation thousands of years into the future. Futurists will ask the Preterist when the signs in the heavens took place. When did the sun turn black like sackcloth made of goat hair, the whole moon turn blood red, and the stars in the sky fall to earth? When did the sky recede like a scroll and every mountain and island get removed from its place? Preterists explain this is apocalyptic language and is used throughout the prophetic scripture to symbolize God powerfully intervening in the affairs of men to accomplish His will. Preterists will offer many OT examples of this kind of language being used to show Gods judgement upon various nations. Finally, Futurists will ask where in history is there record of men calling for rocks to fall on them to hide them from the wrath of God. Preterists point to what Christ said on His way to being crucified. Preterists point out this is a first century context where Christ is telling first century women in Jerusalem not to weep for Him but for themselves because of what is to befall them. Preterists explain it is within this context of judgement upon Jerusalem that Christ speaks of people asking for the mountains to fall on them which is felt to parallel what is said in Revelation 6. This same imagery is seen in reference to previous judgement upon Israel. In Hosea 10:8, in reference to the Northern ten tribes being taken captive by the Assyrians, the prophet writes, “The high places of wickedness will be destroyed-- it is the sin of Israel. Thorns and thistles will grow up and cover their altars. Then they will say to the mountains, "Cover us!" and to the hills, "Fall on us!" It’s pointed out that the historian Josephus actually wrote about the rebel element in first century Jerusalem hiding in caves and caverns in an attempt to escape the destruction that was upon them. 1-17: After this I saw four angels standing at the four corners of the earth, holding back the four winds of the earth to prevent any wind from blowing on the land or on the sea or on any tree. Then I saw another angel coming up from the east, having the seal of the living God. He called out in a loud voice to the four angels who had been given power to harm the land and the sea: "Do not harm the land or the sea or the trees until we put a seal on the foreheads of the servants of our God." Then I heard the number of those who were sealed: 144,000 from all the tribes of Israel. From the tribe of Judah 12,000 were sealed, from the tribe of Reuben 12,000, from the tribe of Gad 12,000, from the tribe of Asher 12,000, from the tribe of Naphtali 12,000, from the tribe of Manasseh 12,000, from the tribe of Simeon 12,000, from the tribe of Levi 12,000, from the tribe of Issachar 12,000, from the tribe of Zebulun 12,000, from the tribe of Joseph 12,000, from the tribe of Benjamin 12,000. After this I looked and there before me was a great multitude that no one could count, from every nation, tribe, people and language, standing before the throne and in front of the Lamb. They were wearing white robes and were holding palm branches in their hands. And they cried out in a loud voice: "Salvation belongs to our God, who sits on the throne, and to the Lamb." All the angels were standing around the throne and around the elders and the four living creatures. They fell down on their faces before the throne and worshiped God, saying: "Amen! Praise and glory and wisdom and thanks and honor and power and strength be to our God for ever and ever. Amen!" Then one of the elders asked me, "These in white robes--who are they, and where did they come from?" I answered, "Sir, you know." And he said, "These are they who have come out of the great tribulation; they have washed their robes and made them white in the blood of the Lamb. Therefore, "they are before the throne of God and serve him day and night in his temple; and he who sits on the throne will spread his tent over them. Never again will they hunger; never again will they thirst. The sun will not beat upon them, nor any scorching heat. For the lamb at the center of the throne will be their shepherd; he will lead them to springs of living water. And God will wipe away every tear from their eyes." Dispensational Premillennialists believe that the faithful of the Church will have been raptured before the sealing of the 144,000 and the great multitude. Those being sealed are those who turn to Christ during the great tribulation and are thus protected from the events associated with the seven last plagues. Other Futurists, who don’t hold to the rapture idea, believe those sealed are the faithful of the church and they will be supernaturally protected from the tribulation. All Futurists believe the 144,000 represent Jews who will be converted to Christ just prior to His return. The great multitude is felt to represent gentile converts or a combination of both Jewish and Gentile converts. Some Futurists believe these converts represent martyred Christians who come out of the great tribulation and are literally standing before the throne of God. Others believe the language relating to their status before God is symbolic and speaks of the Christians spiritual relationship with God after being converted. Preterists see the sealing of the 144,000 and the great multitude as pertaining to God providing a way for the Christians to escape the city of Jerusalem and surrounding areas before the Roman invasion. Preterists point to what Christ said in the Olivet Discourse about seeing the abomination that causes desolation standing in the holy place being the signal to flee to the mountains. Preterists will show from both scriptural and secular history that this abomination standing in the holy place took place during the Roman/Jewish war. The historian Eusebius writes of the Jewish Christians being warned by a prophetic oracle to flee the city just before the Roman siege began. Historians show the Christians escaped to the city of Pella beyond the Jordan River. Preterists also point out that the 144,000 could not pertain to Israelites becoming converted just prior to a yet future return of Christ. In Revelation 14:1-4, the 144,000 are identified as the firstfruits to God and the Lamb. Apostle James, in his letter addressed to the “twelve tribes scattered among the nations,” said, “He chose to give us birth through the word of truth that we might be a kind of firstfruits of all he created” (James 1:1, 18). James is addressing his contemporaries as the firstfruits. A reading of the New Testament scriptures clearly shows that the first converts to Christianity were from the tribes of Israel. Since the concept of firstfruits appears to be associated with those Israelites who became Christians in the first century, it would place the 144,000 in the first century. If the 144,000 are to first make their appearance in our future they could hardly be considered the “firstfruits.” They more appropriately would be labeled the last fruits. Preterists, as do some Futurists, believe the language relating to the status before God of those sealed is symbolic and speaks of the Christians spiritual relationship with God after being converted. 1-13: When he opened the seventh seal, there was silence in heaven for about half an hour. And I saw the seven angels who stand before God, and to them were given seven trumpets. Another angel, who had a golden censer, came and stood at the altar. He was given much incense to offer, with the prayers of all the saints, on the golden altar before the throne. The smoke of the incense, together with the prayers of the saints, went up before God from the angel's hand. Then the angel took the censer, filled it with fire from the altar, and hurled it on the earth; and there came peals of thunder, rumblings, flashes of lightning and an earthquake. Then the seven angels who had the seven trumpets prepared to sound them. The first angel sounded his trumpet, and there came hail and fire mixed with blood, and it was hurled down upon the earth. A third of the earth was burned up, a third of the trees were burned up, and all the green grass was burned up. The second angel sounded his trumpet, and something like a huge mountain, all ablaze, was thrown into the sea. A third of the sea turned into blood, a third of the living creatures in the sea died, and a third of the ships were destroyed. The third angel sounded his trumpet, and a great star, blazing like a torch, fell from the sky on a third of the rivers and on the springs of water-- the name of the star is Wormwood. A third of the waters turned bitter, and many people died from the waters that had become bitter. The fourth angel sounded his trumpet, and a third of the sun was struck, a third of the moon, and a third of the stars, so that a third of them turned dark. A third of the day was without light, and also a third of the night. As I watched, I heard an eagle that was flying in midair call out in a loud voice: "Woe! Woe! 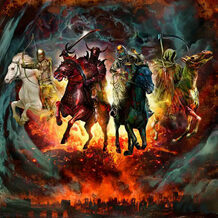 Woe to the inhabitants of the earth, because of the trumpet blasts about to be sounded by the other three angels!" Preterists view the representations associated with opening of the seventh seal as all pertaining to Gods judgement upon Israel which brought about the destruction of the temple and the downfall of Jerusalem along with much of Israel and communities of Jews living in various parts of the Empire. The prayers represented by incense are viewed as the prayers of first century persecuted Christians. The censer filled with coals of fire from the alter and hurled down to the earth is paralleled with the manner in which God instructed ancient Israel to take fire from the altar and burn a city against which God brought judgement. Preterists see judgement coming from the same censer that held prayers as indicative of Gods response to the prayers of the Christians for relief from the persecution leveled upon them by the Jews. While Preterists view much of the wording associated with the seals as apocalyptic language so common in prophetic writing, they do see some parallels to what actually occurred. In reference to the trees and grass being burned up it’s noted that Josephus laments about how the Roman armies cut down all the trees and leveled the gardens outside the city of Jerusalem in order to have materials to build ramps to scale the walls of the city. Josephus wrote that the beautiful suburbs outside the walled city were laid waste due to the war (Wars, V1:1:1). In reference to events associated with the second trumpet, Preterists point to Josephus writing about a battle that took place on the Sea of Galilee where many Jews were killed and the lake was full of blood, dead bodies and shipwrecks (Wars, 111:10:9). As to the mountain burning with fire being thrown into the sea, Preterists see this as symbolic of Jerusalem, known as Mount Zion, being burned by the Romans as gentile nations are sometimes referred to as the sea. The third trumpet speaks of a star called wormwood making the waters bitter. Wormwood is used by OT prophets in speaking of judgement upon Israel for failure to do Gods will (See Jeremiah 9:13-25 & 23:15, KJV). Preterists take note of wormwood in the OT pertaining to judgement upon Israel and view its use in the Revelation as pertaining to judgement upon Israel in the first century. Reference to the sun, moon and stars turning dark is viewed as symbolic language describing the fall of Israel. This same type of language was used by Ezekiel in describing judgement brought upon Israel by Babylon (Ezekiel 32:7-11). This chapter ends with an eagle flying through the air pronouncing a triple woe upon the inhabitants of the Earth. The Greek word translated “earth” is gee. It appears 252 times in the NT and can mean either earth or land. Context best determines how this word should be rendered. By context, it is often seen in the NT to refer to the land of Israel. Since Preterists view the Revelation as pertaining to the first century judgement upon Israel, Preterists feel that gee is better translated as land in the Revelation. The word “eagle” in this passage is translated from the Greek word aetos. The KJV and NKJV of the scriptures use Greek manuscripts that have the Greek angelos in place of aetos and therefore render it as “angel.” Biblical scholars believe aetos to be the correct wording as it is found in most of the ancient manuscripts. This brings an interesting possibility relative to the Preterist view of the Revelation. It is interesting to note from the writings of Josephus, that when the Romans burned the temple, they brought their ensigns to the temple area, set them up against the eastern gate and offered sacrifices to them. The Roman ensigns were eagles. In speaking of conditions extant at the time of His return, Christ said “Where there is a dead body, there the eagles (Greek aetos) will gather” (Luke 17:37). Some Preterists believe Christ is speaking metaphorically of the death of Old Covenant Israel at the hands of the Roman armies who are here represented by eagles. The reference in the Revelation to an eagle announcing three woes is seen as representative of the Romans involvement in the final destruction of the temple and the city. Preterists cite Jeremiah 4:13 and Hosea 8:1 as examples of God referring to eagles as representing judgement against Israel. Futurists see the events associated with the seventh seal as representative of events yet to occur in our future. Some Futurists take a quite literal approach to what is written while others view what is written as symbolic. Futurists view use of the censer in the same way the Preterists do but believe it is Gods judgement upon the entire earth at the end of the church age in response to the prayers of the saints. Many Futurists see the hail, fire and burning of grass and trees as literal events orchestrated by God. Some Futurists see all this as the result of nuclear warfare. The mountain falling into the sea is felt by some to be representative of a modern Babylon made up of a revived Roman Empire headed by the antichrist and a false religious system. This system is seen as thrown into the sea of nations and creating great havoc on the earth. Futurists point out that in Jeremiah 51:25, ancient Babylon is referred to as a “destroying mountain.” Some futurists point out that the Revelation speaks of “something like a huge mountain” and not an actual mountain. It therefore could be an enormous meteor or represent a nuclear bomb. A nuclear bomb exploded in the ocean could easily destroy many ships and kill a great deal of marine life, turning the water red with blood. Futurists see the star called wormwood as symbolic of a political or religious leader misleading the people of the earth or viewed more literally as an actual heavenly body of some sort or a nuclear device contaminating the waters. One Futurist claims that the name for the Russian nuclear power plant Chernobyl, which experienced a meltdown, is the Russian word for wormwood and therefore sees in this a foreshadowing of what is prophesied in the Revelation. Some Futurists see the darkening of the sun moon and stars as symbolic of judgement upon the political/religious powers of the revived Roman Empire. Some see the darkening due to nuclear warfare while others see direct interference by God in the normal operation of these heavenly bodies. Like Preterists, most Futurist commentators agree that eagle and not angel is the proper translation in this passage. Futurists, however, do not view the eagle as representing Rome bringing judgement but simply as a messenger, possible the fourth living creature who is described as an eagle and is seen before the throne in chapter 4:7.